Captain Jim is a Dynamic Performer & Speaker who connects with all ages. 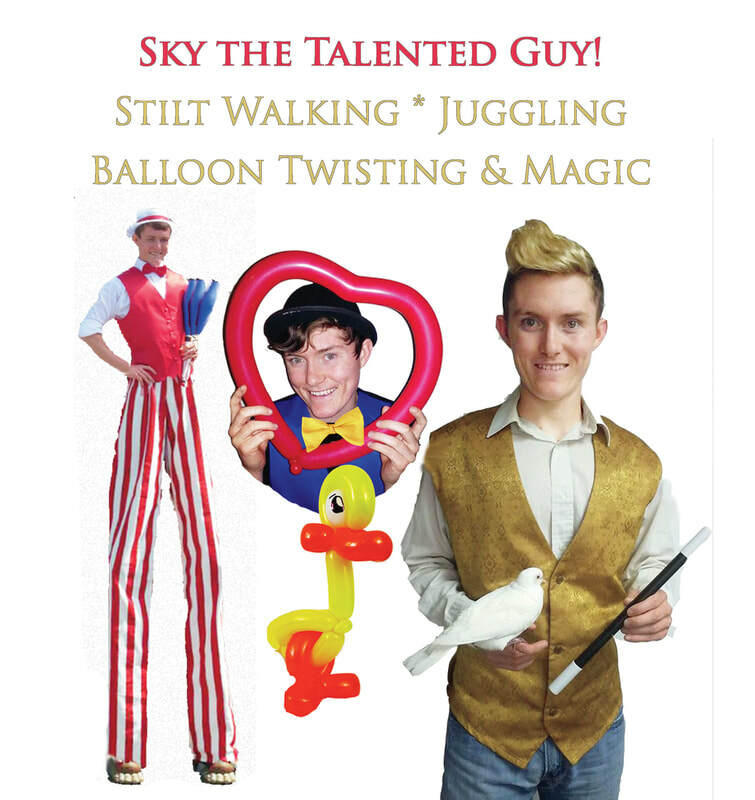 * Award Winning Illusion Shows mixed with humor and age appropriate Life Lessons. * He gets better with age...The Audiences age that is. * The older you get the more you get out of what his shows got. It's not just Elementary my Dear Watson! Faculty - Appreciation Day, Blow off some Steam Day! Illusions mixed with humor, team building, getting through challenges, etc. College & High Schools - Some of his best audiences. They scream, shout & freak out over the amazing illusions performed to high energy music. They laugh at their friends on stage & well receive the life lessons so intertwined in the show. The climax is when Captain Jim transforms from 2 legs to a wooden peg leg. Students think that is the most awesome illusion yet....Then he reveals the real deal...It's NO illusion. He shares his own personal story of being hit by a motorist who was texting while driving causing the loss of his leg. The motorist made the wrong choice in life and Captain Jim had to make the right choice to carry on in life. Powerful story, powerful show! Actual words from a UNCG College Student: Amy B. Greensboro, NC - Captain Jim, that was an amazing show! I mean...what just happen in front of me? I can not explain! Just WOW, FREAKY! You had all of us laughing and then you shared so much for us to think about in life...that touched us. Thank you so much. Awesome! 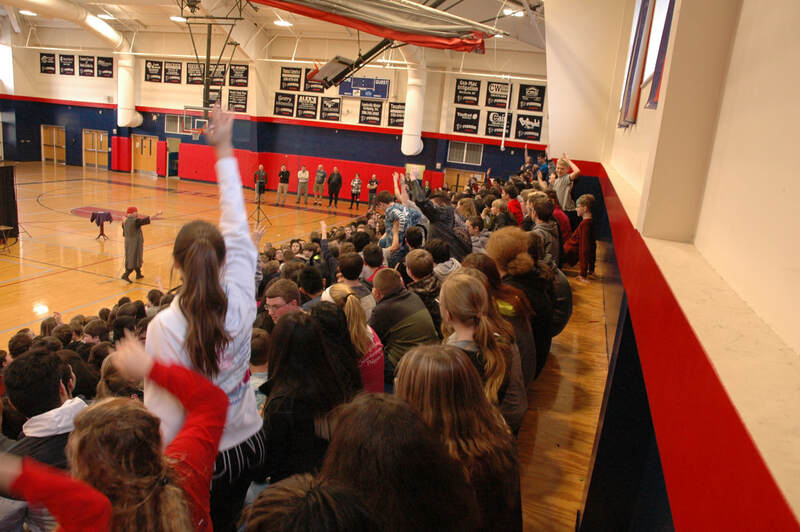 Middle Schools - Once again one of his best audiences but his most quite audiences. Middle Schoolers are at the age they don't want to act like anything at school is cool but they are entranced by Captain Jim's performance. Illusions that freak their minds quietly with life lessons that impact them. Captain Jim touches base on many life lessons, such as, NO Bullying. He shares his own personal story of being Bullied in Middle School and how it effected his High School years. Captain Jim knows he gets through to them because they approach him after the show & by email. "Thanks captain Jim for coming to west lee middle... as a middle scholar I would have thought the magic would have been dumb but the way you put it, it was amazing!! And I get the messages you were telling us. I just wanted to thank you so much!! My teacher even let me edit the photos of your show!!! Any way Thanks again and I hope to see you in any other event it was great!!!!!!!!!" Elementary Schools - Build a good foundation. Get them started out in life with Light hearted words of wisdom mixed with fun for everyone. Amazing Magic, Live Animals appear mixed with Character Education on Reading, Working Together, Manners, Respect, etc. Nautical Magic makes learning fun! Ask for details. texting. Incorporates the loss of his leg in show as an illusion. Then tells the real deal. Powerful story in a powerful show! Hello Captain Jim , My name is Amber Mason, I am a Children's Programmer with the Valdese Public Library. In the 12 years that I have worked at the Library, your show is by far one of the MOST popular we have had! I brought my 16 year old daughter to Captain Jim's Teen Summer Reading Program. I sat in the back corner. Before the show started Captain Jim called me out and said that I need to come up and get a good seat because the front row is where I will wind up. He was so right! My mouth & eyes stayed wide open the entire show. It was amazing in every way. Form the illusions he performed to the humor & life lessons he spoke. WOW, more than I ever expected! When leaving for the show. My neighbors said they could not believe I was taking my teen to a Magic show. When I got home I told my neighbors they missed an outstanding show! My daughter wants you for her next Teen Party! Well done Captain Jim! "Our Elementary students just loved Captain Jim at our School. An amazing show of Magic with a profound message on Reading, Education & Respect, Thank you." H. Orr. "Captain Jim gave a fantastic performance for our College students. They were freaking out over the illusions & laughing at their friends on stage. Then it got dead silent when Captain Jim chopped off his leg to end the show wearing a peg leg. He then told his story....a profound way to end his lecture on making the right choices & getting though challenges. Bravo, Captain! : W. Hazel. "D.J. C.J. did a great job at our school dance. Clean top hit tunes. Nice dance lighting. He kept everything running smoothly with announcements. He even performed a 15min Magic show that has everyone captivated. Nice touch that other D.J. 's can't provide. He really pumps up the crowd for the cause. We find that school spirit rises after Captain Jim has been to our school, both from students and parents." B. Nelson. "Captain Jim & Sea Shel have provided their Magic, Mystery & Pirate History program for our 4th graders the past 5yrs. He and Sea Shel are very educational with the Pirate History and it's never boring. 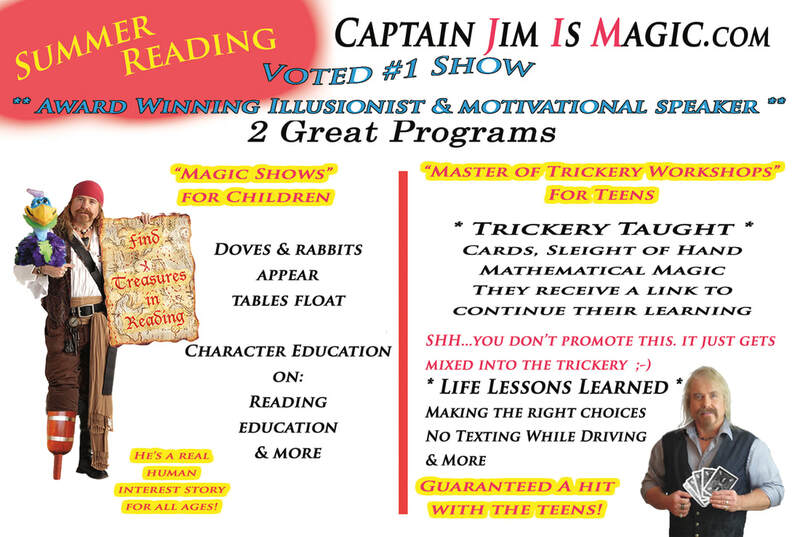 Captain Jim keeps the learning exciting with his pirate magic!" J. Turner, Lewisville Elementary. "Captain Jim has been performing though-out our Library system for several years. His Summer Reading Programs are outstanding not only for the Children but for our Teen and Adult Programs as well. He always has an exciting fresh Magic Show with a great message on reading & supporting the Library for each age group. He is moving and entertaining." D. White, Forsyth Co. Libraries.